Dental implant is an artificial tooth root that is surgically placed into the jaw to hold a replacement tooth, bridge or denture in place. With the exception of your natural tooth, when done correctly, nothing looks more natural than a Dental implant. 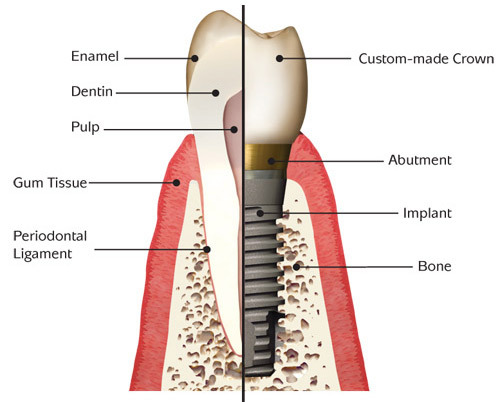 A Dental implant involves a surgical grade titanium screw that is placed into the jawbone. The matrial used has a unique ability to fuse directly into the bone through a process known as "osseo-integration." Via this process the bone cells attach themselves directly to the titanium surface, essentially locking the implant into the jaw bone. After this a carefully chosen custom-made crown is placed on the implant to restore the natural look of the tooth. There are several reasons why Dental implants are preferred over other options. For example, Dental implants look and feel like your own teeth; they prevent bone and gum tissue loss that can happen with regular bridges; they preserve the jawbone preventing premature aging and "sunken-in" look; they preserve and restore chewing, smiling and speech functions better. Why choose Dr. Kodey for your implants? Placing a Dental implant requires a lot of knowledge, experience, clinical judgment and atistic skills. When done correctly, and this is key, a Dental implant is there to stay for a long time (sometimes even an entire lifetime). Dr. Kodey is renowned for her ability to perform her work with clinical dextrity and aristic perfection that natually make her patients prefer her for complex Dental procedures, like implants. While selecting a Dentist for this procedure it might be tempting to go with the absolute bargain-basement pricing. But consider this -- an implant is a foreign material that is placed inside the tight confies of your jawbone. The angle, depth and technique of placement become very important for the long term success of the procedure. When done as just a business proposition, the end result is not satisifying to the patient. Therefore, along with afforability, selecting the correct Dentist who has the required clinical and artistic expertice becomes very imporant in opting for a surgical procedure like Implants. We encourage you to first discuss your case at length before choosing the appropriate Dentist to perform this surgical procedure. Take online appointment or call Dr. Kodey at (650) 988-0700 to discuss your case. Can I know more about Dental Implants? Exlpore the following videos to learn more about Cosmetic Dentistry.